rare diseases are strikingly similar: on average 7 years to get a diagnosis, lack of specialists, being labelled a hypochondriac, no effective treatments available, and not recognized or understood very well by society. Tania Tirraoro started the blog, SPECIAL NEEDS JUNGLE, to help parents “who are entering the jungle of special needs education.” In this blog, she shares her experiences as she advocated for her two sons with special needs. 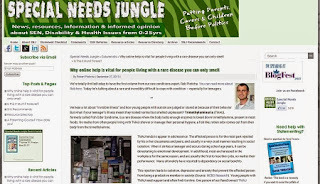 On September 27, 2013, Robert Pleticha, the Online Communities Manager for RareConnect, and columnist for Special Needs Jungle (SNJ) wrote a post in this blog, Why online help is vital for people living with a rare disease you can only smell. In this article about living with Trimethylaminuria, Rob depicts the detrimental psycho-social impact this condition has on sufferers, since TMAU tends to first appear in adolescence, a crucial stage of a person's development. Rob presents statistics provided by EURORDIS that depicts why TMAU is considered a rare disease. A disease is defined as rare in Europe when it affects less than 1 in 2000 people. One rare disease may affect only a handful of patients in the EU, and another touch as many as 245,000. (Source: EURORDIS) Due to under diagnosis and misdiagnosis, we really can’t be sure of the number of people living with many rare diseases. We think of rare diseases as disparate conditions with names like: Epidermolysis bullosa, Dravet syndrome, or Familial Mediterranean fever. But the challenges people living with some of the 6,000 rare diseases are strikingly similar: on average 7 years to get a diagnosis, lack of specialists, being labelled a hypochondriac, no effective treatments available, and not recognized or understood very well by society. Thanks, Rob, for presenting our case.